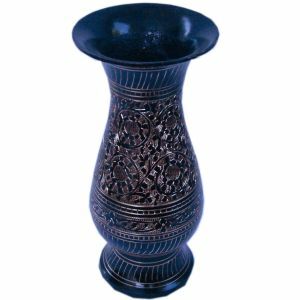 This handcrafted golden meenakari flower vase is decorated with fine golden meenakari work made of black metal. It is an exclusive show piece for your drawing room; sure to be admired by your guests. Availability: The product would be shipped within 3 working days. Price includes all type of taxes. quality commitment: Original and genuine product. Disclaimer: The item being handmade; the fine design, pattern and color tone of the product may vary slightly from that shown in the image. However, there wonâ€™t be any compromise in quality.